GO TAKE A HIKE – HIKE THE WHITE MOUNTAINS! It is that time of year when we tell you to “Go Take a Hike” in the White Mountains! The Inn at Ellis River is in the heart of the Mount Washington Valley area central to many hiking trails, hiking centers and waterfalls. There are hiking trails for all activity levels from beginners to intermediate to the professional, avid hiker. Some hikes in the area are easy walks to waterfalls – some of which the Inn’s rooms are named after such as Diana’s Baths, Glen Ellis Falls or Crystal Cascades. Want a challenge? 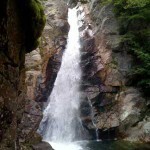 You will find many more intense hikes such as Tuckerman Ravine which is one trail leading to a very challenging hike by continuing on to hiking to the Mount Washington Summit. Hike some or all of the “4,000 Footers” which, of course includes the highest; Mount Washington – most of which are in the White Mountains. Many hikes in the Mount Washington/ White Mountains area have spectacular views of the mountain summits, lakes, waterfalls and so on.